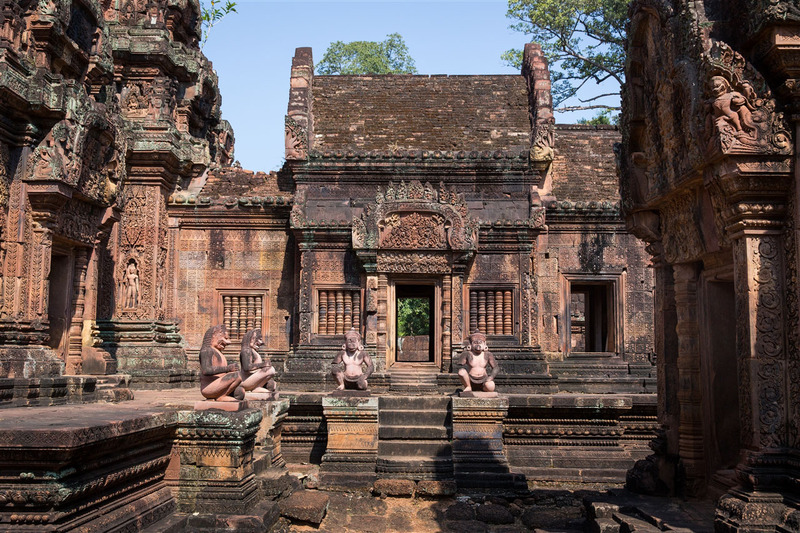 Banteay Srei was not built by a king, but by two local dignitaries, Yajnavaraha, a trusted guru to king Rajendravarman II, and his brother. 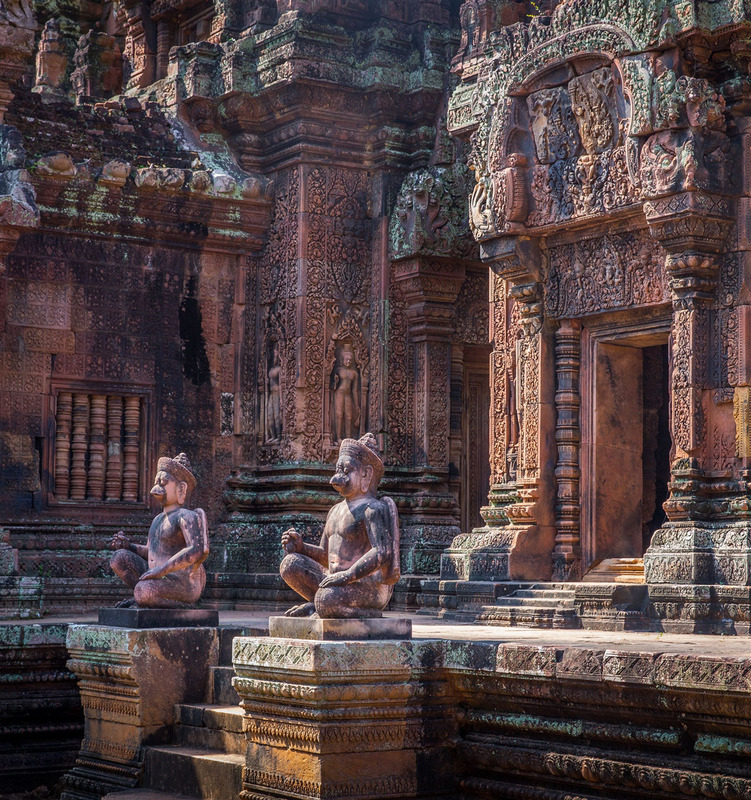 It was consecrated in 967 A.D. 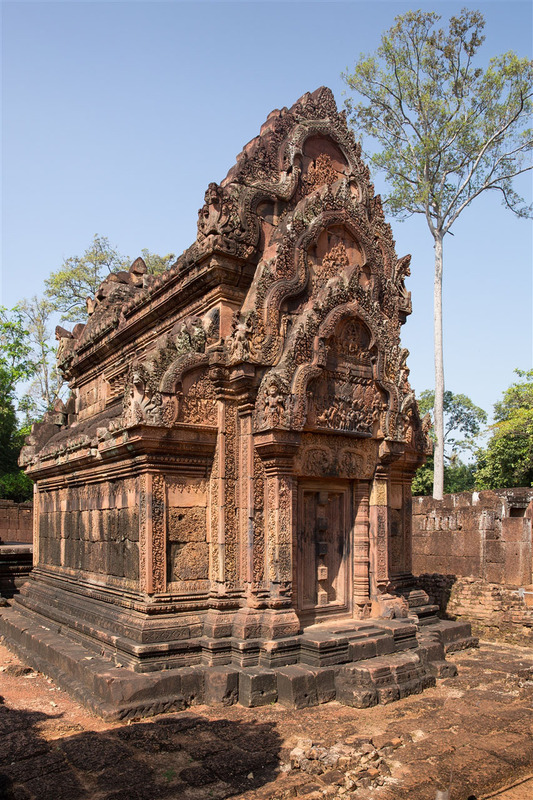 The temple was primarily dedicated to the Hindu god Shiva. 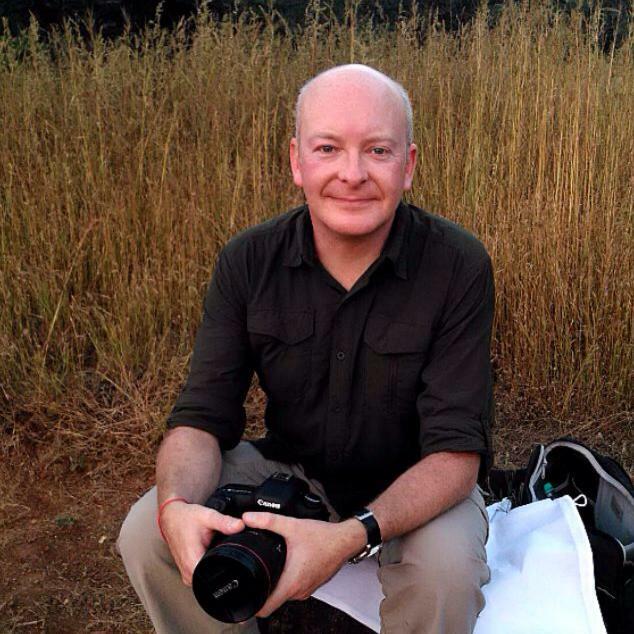 and was originally called Tribhuvanamaheśvara (great lord of the threefold world). 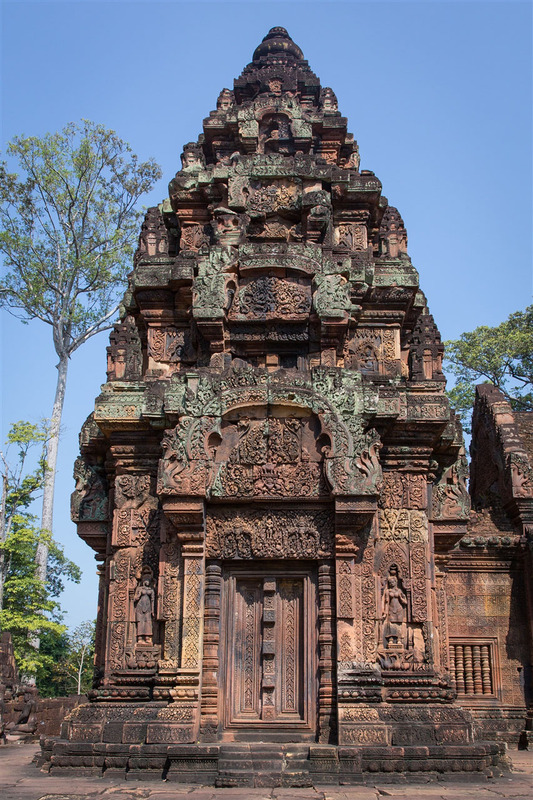 The temple’s modern name, Bantãy Srĕi (citadel of the women, or citadel of beauty) is probably related to the intricacy of the spectacular bas-relief carvings found on the walls, and the tiny dimensions of the buildings themselves. 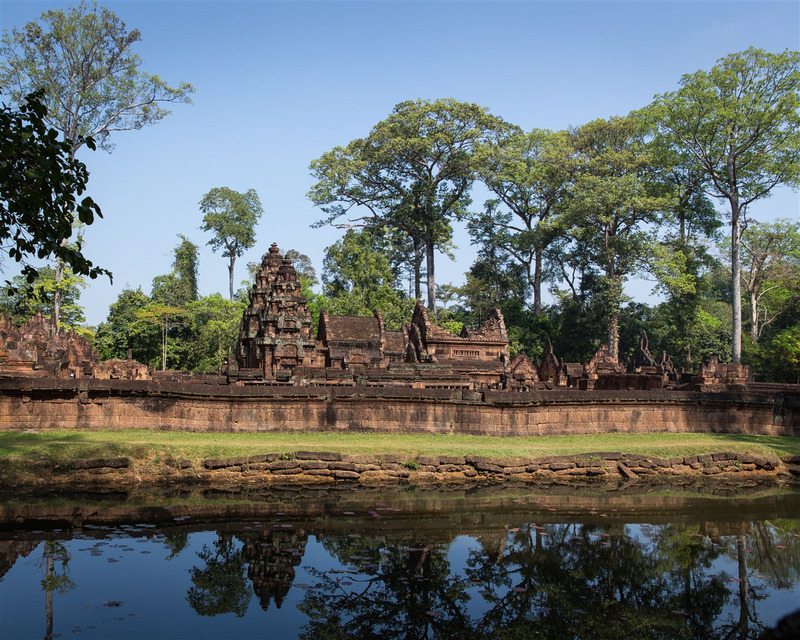 The temple layout is relatively simple. A 75m processional way leads you the east gate built into the third enclosing wall. 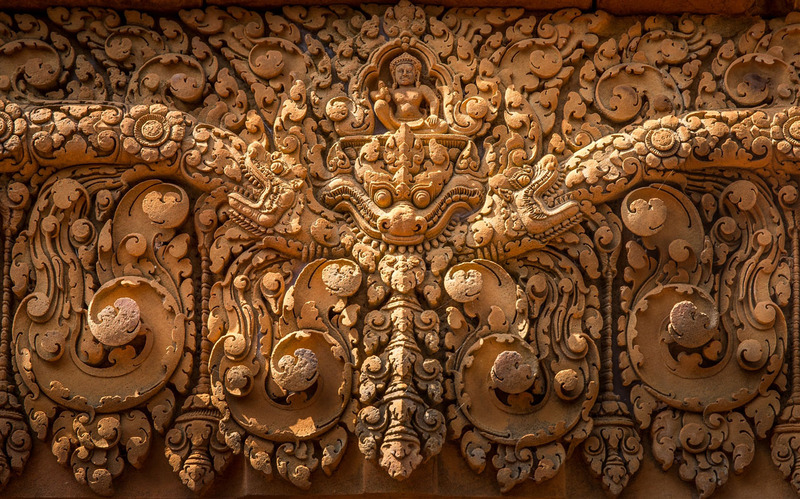 It’s here you get your first taste of the wonderful carvings that are to follow, the exterior of the east gate depicts Indra, the sky god, squatting on the three-headed elephant Airavata. 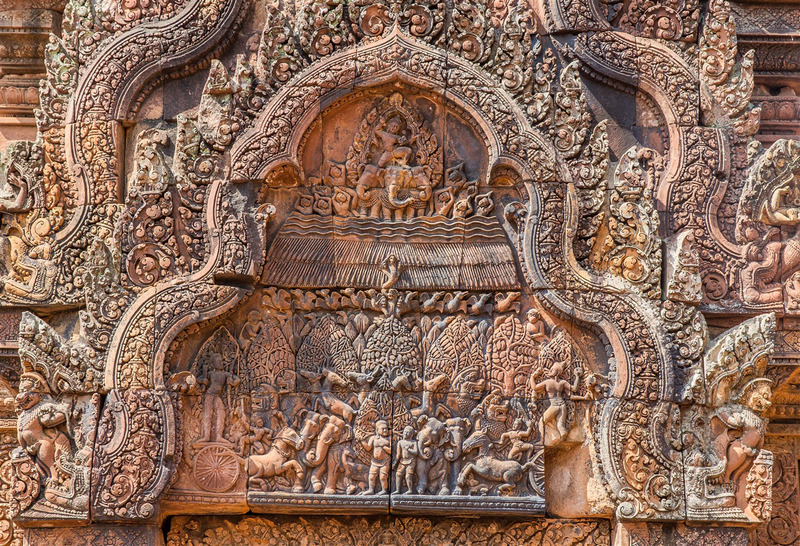 Near to the east gate is another exquisite caving, this time a pediment that is lying on the ground, showing Sita swooning as she is being abducted by Ravana. From the east gate you cross a causeway over the surrounding moat and through another gateway of the second enclosure wall. 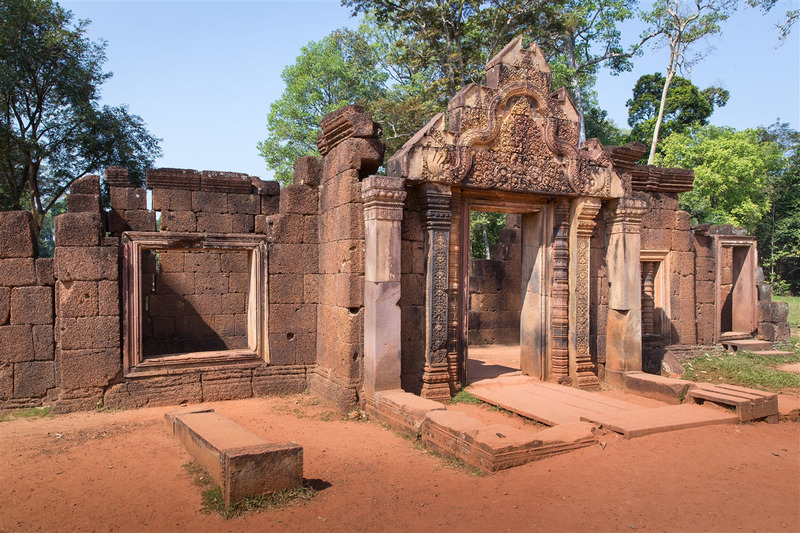 This takes you to the heart of the temple complex with galleries surrounding the final enclosure wall containing the central sanctuary, two sanctuary towers, and two libraries. 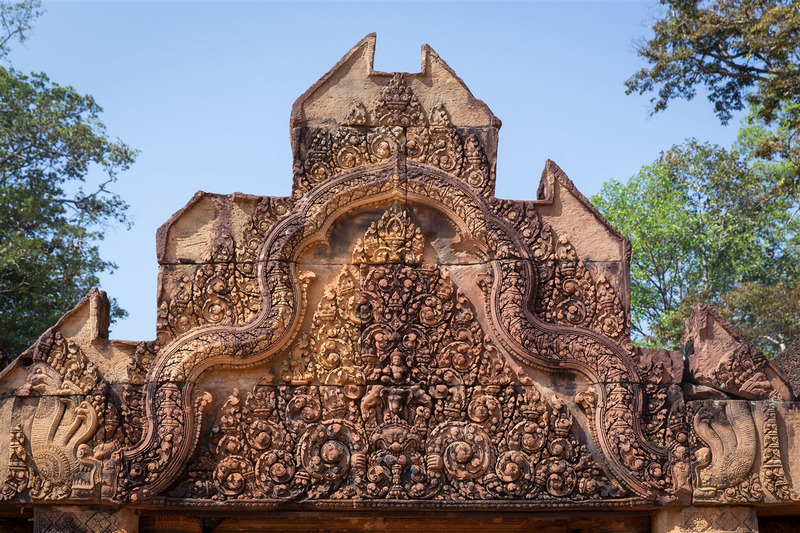 Banteay Srei is known for the intricacy of its carvings, and they are simply amazing – nothing else exists quite like this anywhere else in Angkor. 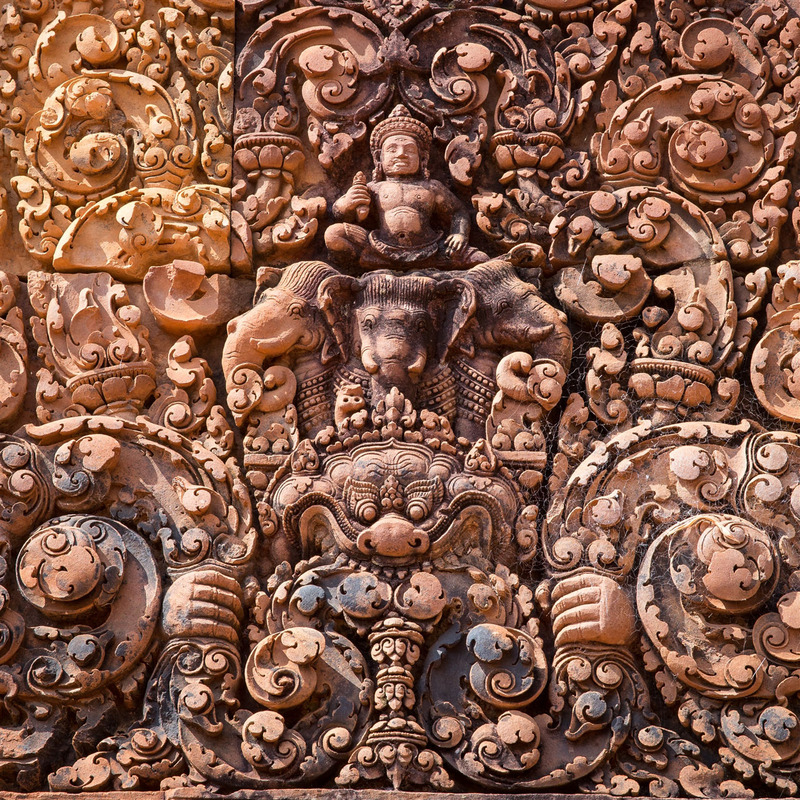 The temple was built largely of hard red sandstone that could be carved like wood, and the detail is simply staggering. I felt like I was in an an open air art gallery. The heart of the complex is hugely atmospheric, but public access is not permitted. 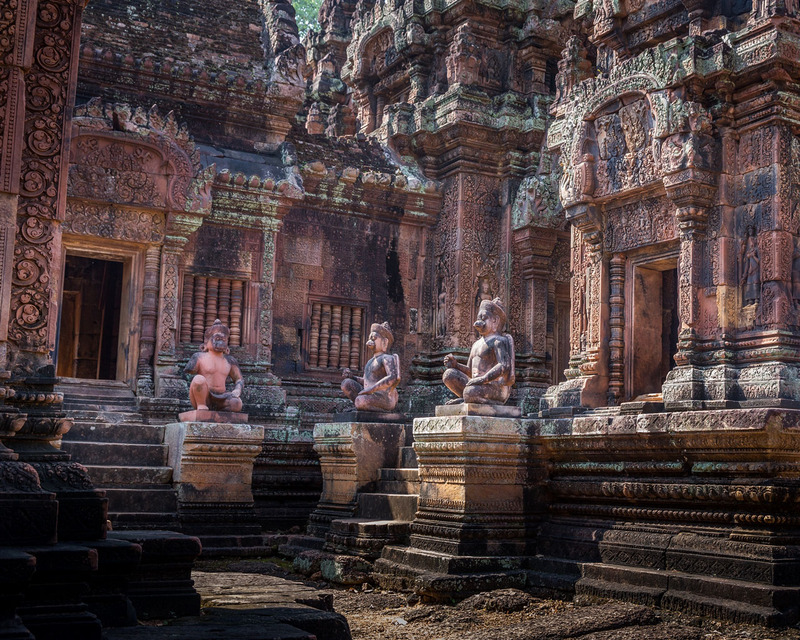 I can appreciate way, it’s a compact area with intricate carvings everywhere – the volume of tourists in such a small space would not be sustainable. 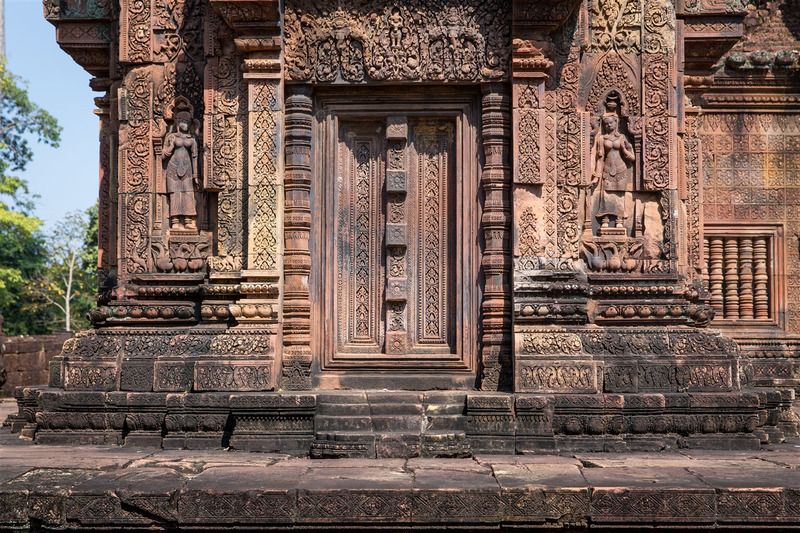 Virtually no surface within the first enclosure remains unadorned, and it all seems perfect in every detail. 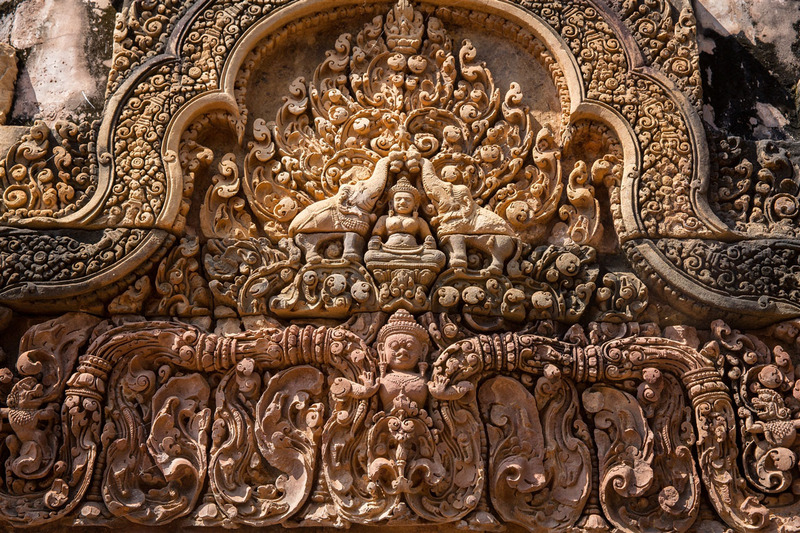 It’s quite difficult to take in the sheer wealth of the decoration, and it takes a little time for your eyes to adjust. I’d highly recommend taking at least two circuits around the heart of the complex, you are bound to miss details on your first pass by. 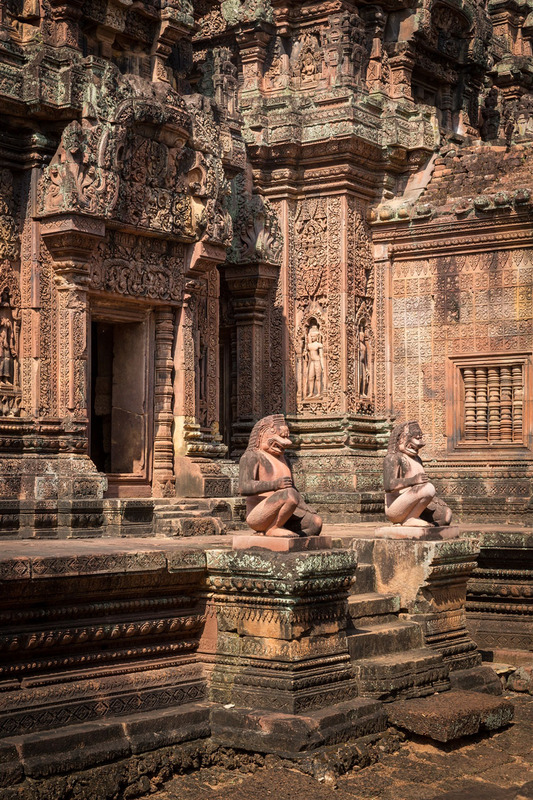 Amazingly temple was rediscovered only in 1914, and was the subject of a case of art theft when André Malraux stole four sets of carvings in 1923. 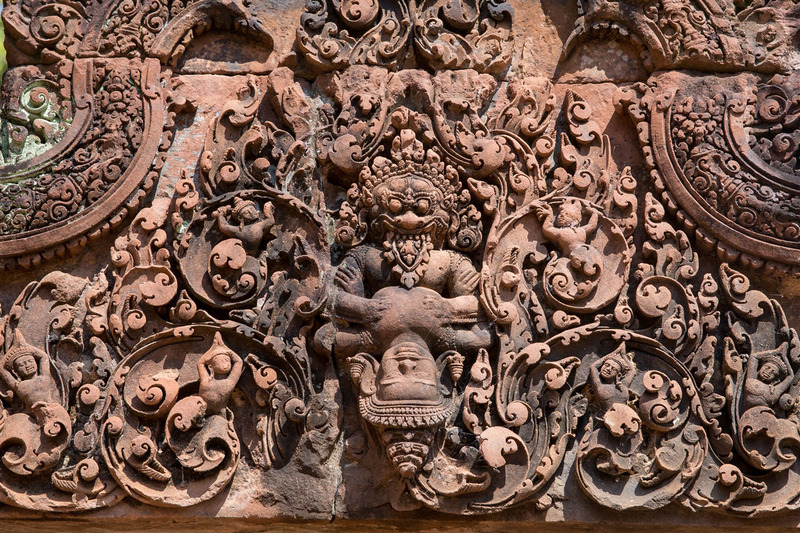 He was quickly arrested and the carvings returned. 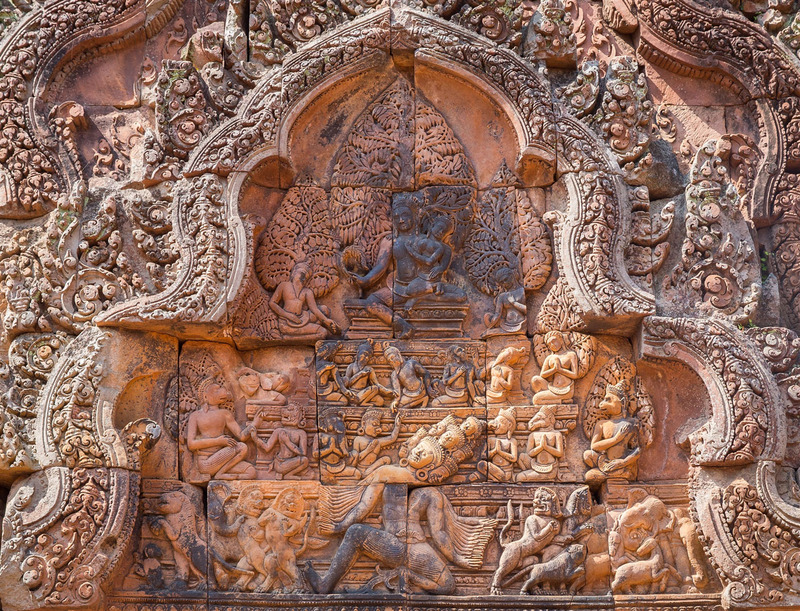 The incident stimulated interest in the site, which was cleared the following year, and in the 1930s Banteay Srei was restored through the first important use of anastylosis at Angkor. 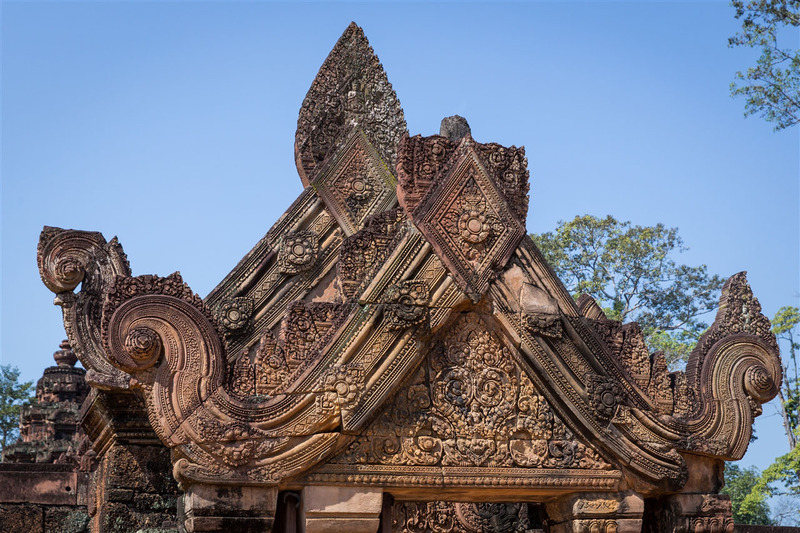 Anastylosis is where a ruined building or monument is restored using the original architectural elements to the greatest degree possible. 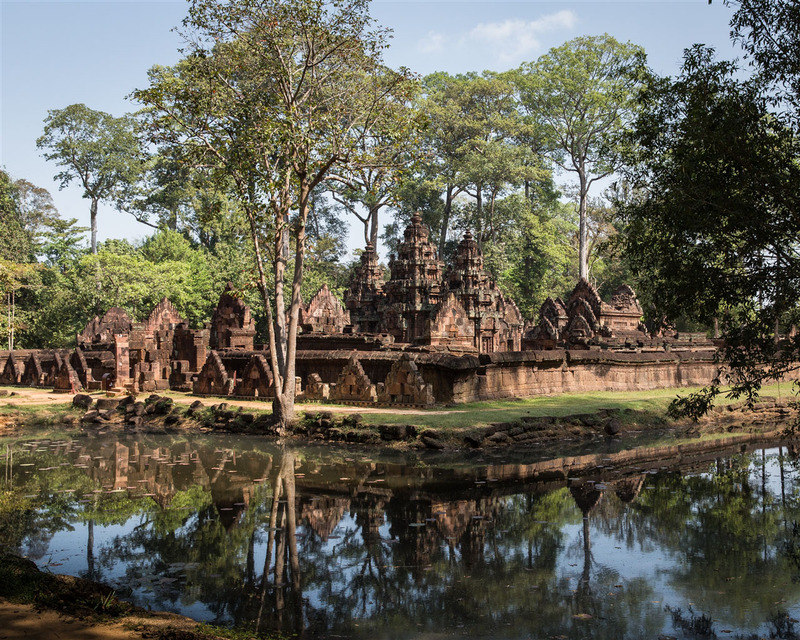 You exit the temple through the far west gate, and a path leads you back to the entrance alongside the moat. 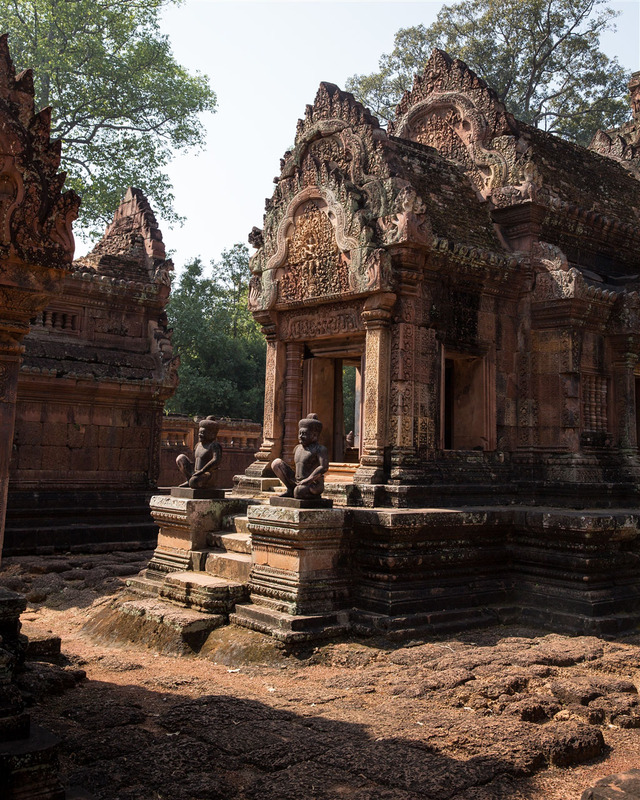 The setting for this small temple is just perfect, and is of course best enjoyed when the tourist numbers are low. 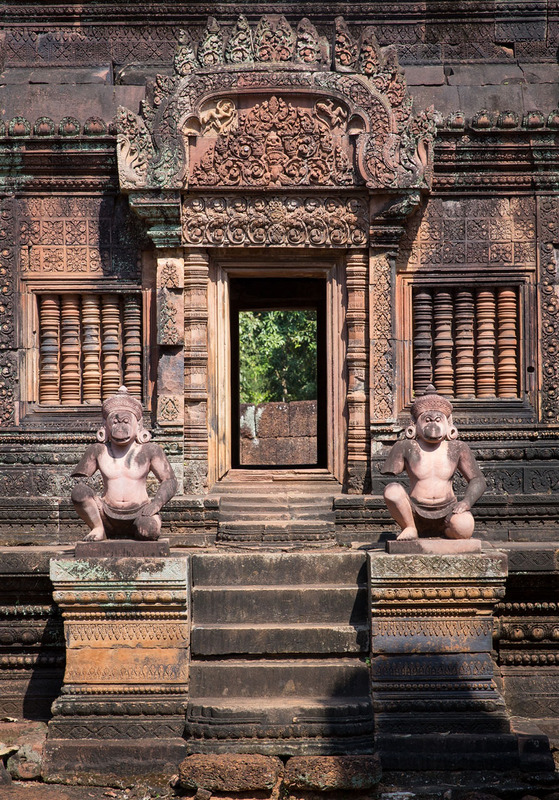 If at all possible get to Banteay Srei as early as possible so you can enjoy it in relative peace. 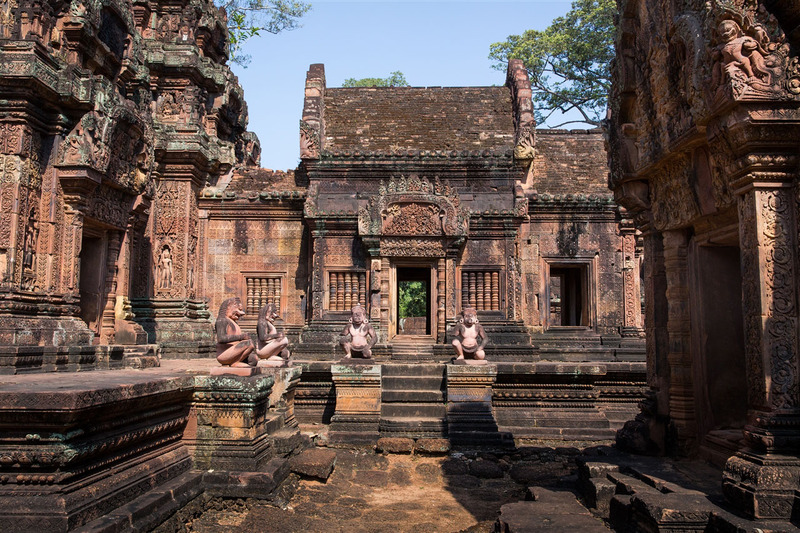 Of all the temple sites I visited around Angkor during my three day exploration of the area, Banteay Srei was possibly the highlight, so it’s well worth making the effort to see it.